In the late 1870’s and early 1880’s, the annual number of Scandinavian emigrants passing through Liverpool reached 50,000. Therefore decision was made to establish a religious mission in Liverpool, in order to meet the pastoral needs of Scandinavian seamen and the growing number of emigrants, some passing through the port en-route to North America and other overseas destinations. The Swedish-Norwegian Church Council in London, where a mission had already been established by the Evangelical Patriotic Foundation (Evangeliska Fosterlands-Stiftelsen) in 1862, decided upon a similar mission in Liverpool. 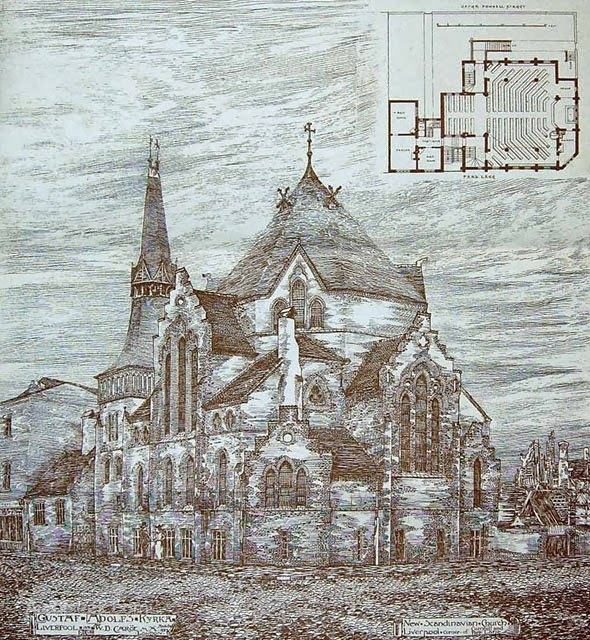 The commission to design and build the church at 138 Park Lane, Liverpool, was given to a young architect, William Douglas Caroe, who went on to be a major representative of the closing phase of the Gothic revival in Britain. William Caroe was born in 1857, educated at Ruabon and Trinity College Cambridge, and articled to John Loughborough Pearson. He became known as “a consummate master of building according to medieval precedent”. Caroe almost certainly obtained the commission through his father, who was then the Danish Consul in Liverpool. The result was the creation of a unique building, which contained many Scandinavian features, including stepped gables and a concave sided lead covered spire over the entrance. Construction costs amounted to 50.000 Swedish crowns, a mere £15,000 today. The building was started in 1883 and completed in 1884. The first priest, Per August Tegner, arrived in Liverpool on 22 August 1870 and the first service was held six days later. The church still stands today as one of only 4 octagonal church buildings in the UK and one of about 30 in Sweden. It was also the first Swedish church built overseas, although there were missions operating out of other premises. The church is a Grade II'* listed building and remains a distinct feature of the docklands area of Liverpool. It was viewed by contemporise as “the largest and most beautiful seaman’s church in the world. 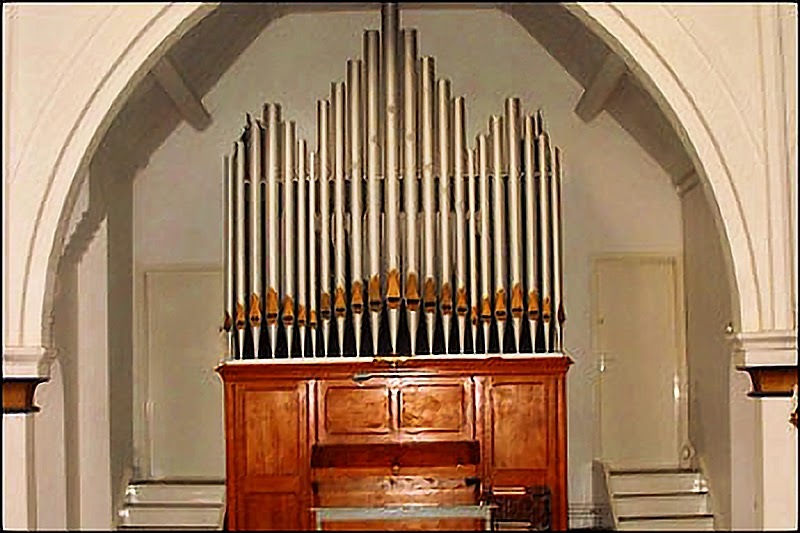 The original building has not been altered significantly to any degree, apart from the decision, some time ago, to remove the balconies from the original two storey place of worship and to install a middle floor, thus creating a separate location for social events between the basement and the actual church. (1863-1933). These reliefs used to form the reredos to the altar, but now hang separately in the church. Bell was an important figure in the development of Art Nouveau in Britain and was influential at Liverpool’s university School of Architecture and Applied Arts from the late 1890’s before gaining a professorship at the Glasgow School of Art from 1911 and then at the Royal College of Art, after the end of the first world war. There are also two important statues by the local sculptor Arthur Dooley, these figures are the Madonna and the Christ figures. Dooley was born in Liverpool and initially apprenticed as a welder in a Birkenhead shipyard. After studying at St Martin’s school, he became an internationally recognised sculptor, primarily of religious works, usually made in either bronze or scrap metal. Prior to his death, Dooley was a regular visitor to the church.